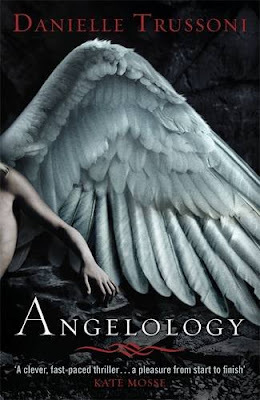 Angelology took me a good hundred pages to get into. I felt I was hanging with this book because I’d heard so much about it. One minute there would be five chapters that were boring and focusing on Evangeline and the next minute you’d have one chapter which was good and had a lot of action, and then you’d expect more and it would just go back to boring. The book in a sense was well thought out and the plot was clever, but the only reason it was as thick as it was is because it is filled with unnecessary details that just bore you. Of course if there were to be a sequel where these details somehow gained an importance then that would be great, but if it wasn’t for these details the book would be the size of twilight. My favourite parts were definitely the finding, creating and destroying of the lyre, and the second expedition. They were tense, and had the right amount of actions. The obvious part was that Angela was Percival and Gabriella’s baby. The characters were not as close to you as they are in some other books as I think Danielle tried to portray the characters in an outsider’s point of view, so that changed my view on how I thought about the characters. My favourite character was definitely Gabriella. She had something dark and dangerous about her, and she was most definitely exiting. She grew to be a very valued character and when she was killed it came as a sort of surprise that she didn’t put up a fight. The grammar was good, although the odd word or two was misspelt, I think. I have to admit the book is epic, but more of a modern classic than a new cool YA read. The Lyre. That’s what the whole book is about, it all focuses on the lyre. As long as the Lyre is hidden the Nephilim (Human, Angel Hybrid) cannot take dominion over the world. The book isn’t at all complex as it looks from the thickness, but it is a slow read because the boring details just slow you down. The book is though worth a full five stars, and I guarantee will become a modern classic. I did not like the ending, I felt it was all wrong. I realize there will be more, but I hate to be left not knowing anything. A great story until the end.